Lahore, September 9, 2018: Vivo has announced the new V11 and V11 Pro in Pakistan today. This new increase in Vivo's leading V series has come with an art-intelligence camera that helps users to capture the best images in every kind of environment. Many new features in the design of the V11 and V11 Pro, such as the new Halo FullView ™ display and the two new colors Starry Night and Nebula Fusion are presented in the Curved (Curved) Third D Body, provide users with a unique experience.V11 Pro in the V Series is the first smartphone that has been added to the fingerprint skiing technology within the display. While maintaining the fine and stylish design, Vivo maintained its dedication in the field of biometric security. After the success of V9 in the early years of this year, Vivo increased efforts to develop artificial intelligence so that the demand for powerful photographic features working in every kind of scenario. The combination of two cameras in the back of the V11 Pro is 5 and 12 megapixels in respect of respectively, f / 1.8 with large uppercase. Pixel size is only 1.28 mm in these cameras, while the front camera is 25 megapixels. The 12-megapixel rear camera increases its sensitivity for the light of dual Pixel sensors by its 24 million Zia-sensitive (photocopying senses) units and improves the DSLR's dual-pixel auto-focus technology that can focus at just a short time of 0.03 seconds. However, on the other hand, in the V11 also back on the back-of-the-two cameras that are 5 and 16 megapixels respectively and is on the 25-megapixel AI camera front.With these innovative features that remove many challenges present during photography and convert fans into the most professional photographer, ever drawing pictures of the best was never so easy.The AI Backlight HDR and the AI Low Light Mode draw many frames to get the maximum detail using an artificially intelligent algorithm and then combine them with the best images, even in an environment where light is inappropriate. Eg sunrise. The new increase in AI photography features list is the AI Scene Recognition, which can identify different objects, elements, and scenes, and according to that, the image produces special improvements so that your photos emerge.It is introduced with a new AI Face Shaping technology, AI Face Modeling algorithm to pull the best cells all over the time, which improves the face of your face in an individual face so that the cells look beautiful but natural. Enhanced AI Selfie Lighting features AI algorithms provide more light fits with the help of how the face of the user is affected by a light dimensionally. Apart from all this, dragging the best portrait by making you guide through AI Portrait Framing Synthetic Intelligent makes it very easy. This feature tells you at what position the phone should be placed so that you can always pull the best portrait. In addition to photography, Vivo's artificial intelligence assistant in V11 and V11 Pro, Jovi, spreads out artificial intelligence experience with its features such as Jovi Smart Scene, Google Lens and Google Assistant. Jovi SmartCan makes the user's life easier by observing and performing user environment or scenario. Such as delivery of weather and real-time information from weather conditions.The Google Assistant provides daily navigation, such as Map Navigation, online shopping, travel arrangements, music, video, and social media support, while Google Lenses, which have helped with the latest deep learning algorithms. Gives the ability to find out what he is looking for.In order to deliver these incredible features into the V11 Pro Snapper Dragon 660AIE processor, 6GB RAM and 128 GB ROM is installed so that high performance can be made. On the other hand, the V11 features Helio P60 processors, 4GB RAMs, and 128GB ROMs.The latest Funtouch OS 4.5 based on Andrews 8.1 and the Jovi AI Engine Miller effectively coincide with CPU and memory resources so that many complex operations can be performed.V11 and V11 Pro have Vivo's Dual Engine Fast Charging System, which recharges the battery fast but also saves overheating in addition to 9 different computing layers. I have an aspect ratio of 19.5: 9, 6.41 inches Super AMOLED Halo FullView ™ display with a 91.27% screen-to-body ratio. Screenshot in V11 is 6.3 inches but the display is the same Halo FullView ™. 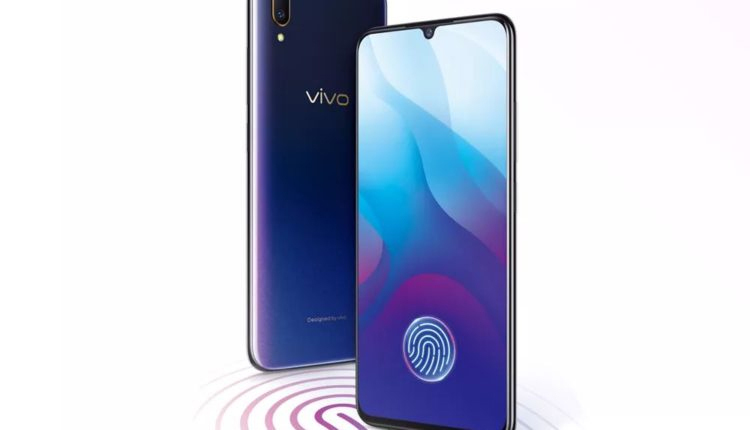 Due to the most precise 1.76 cm bezels and co-dimensional curved body design, the sides of the phone also become part of the display, which seems to be an immersive design and the phone runs in your hand.V11 Pro V series is the first model in which the In-Display fingerprint scanning technology has been incorporated, which eliminated the visible fingerprint pad and a similar design of Front and Back was obtained. This technology first came to the scene in the CES early this year, and it could make big screens without compromising the skill. Adding this modern technology to V11 Pro shows the efforts of Wave to help consumers' problems.The accuracy of Face Access in V11 and V11 Pro has been enhanced with Infrastructure Red Light, which now scans 1024 Feature Feature Points and lasts in a moment. Even in the dark, this feature works.Wave has inspired two new trendy Color Starry Night and Nebula, inspired by the mystery of the universe. The Black and Blue combination of the Starry Night while Nebula's bright blue and purple stirring glow stars from the present galaxies, and make V11 and V11 Pro the future designs. Vivo V11 and V11 Pro pre-order orders are being received in Pakistan, while the official sales chain will begin from September 13. The value of V11 is Rs 39,999 while V11 Pro will be 49,999.